The mystery elevator finally began to make some sense with this photo. 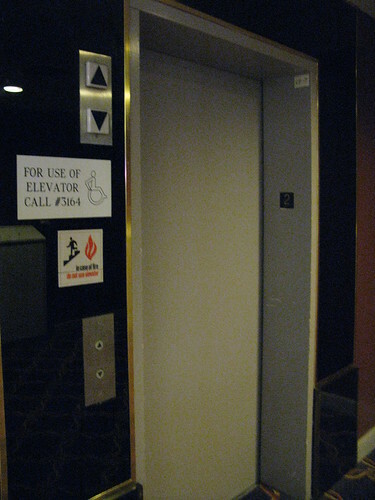 In the other photo, the interior of the elevator featured an unusual cut-out switch for the 2nd floor on the car operation panel. Here is it clear why: the hallway buttons were likely disabled and enabled by that switch. If someone legitimately needed to use the elevator, they would use a house phone to call extension 3164. Then someone would go to either the first or third floor and bring the elevator to the second floor. Thus, the intent was that guests would never see this elevator because they were never supposed to be on the first or third floors unattended (whereas guests were frequently unattended on the once busy nearby casino floor on the second floor).